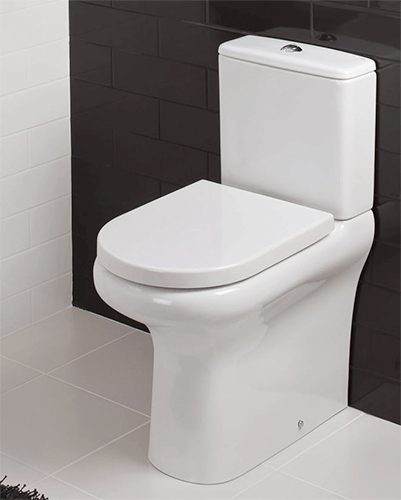 If you are planning to replace an existing toilet there are lots of things to plan and source first. 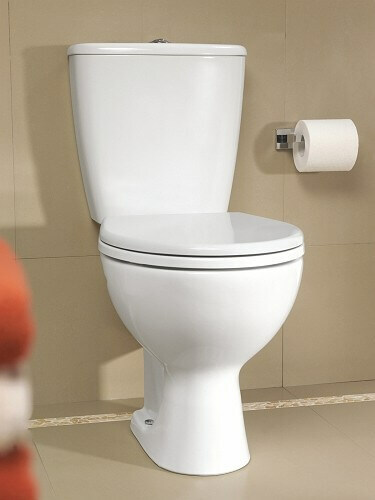 If there is no existing toilet you will need a professional to install the relevant pipework before you fit the toilet. A professional plumber should take care that they are routing the sewage from the toilet into the sewers and not into a nearby storm/rainwater drain, as it is easy to mix them up. New toilet and cistern, a piece of flexible hose and any manufacturers instructions, wrenches, screwdriver, pliers, spanner, spirit level, tape measure, bucket and towel/old cloth. 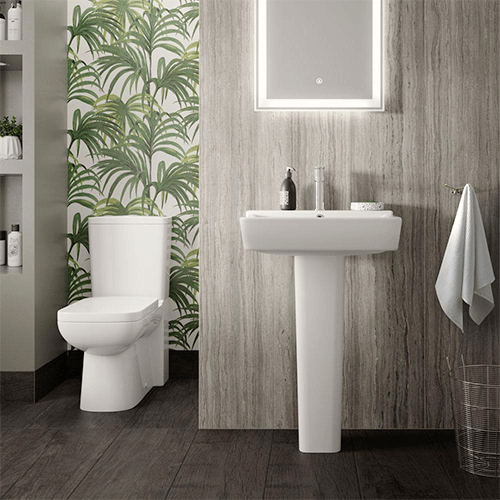 If you are replacing an old toilet you will need to remove it first, this can prove tricky if you only have one toilet in the house so choose your timing carefully, maybe when everyone is at school or work. Give the toilet a good wipe with anti-bacterial wipes first to make it nicer to work on, and wear some rubber or work gloves too, they help with grip and cleanliness. There should be a shut-off valve on the pipe that allows water into the toilet cistern.Turn this off and flush the toilet until the pan and cistern are as empty as possible. There will still be water left in the pan and the cistern so you will need to empty both, the easiest is with a small cup or beaker scooping the water out as much as you can, then just use an old cloth or towel to soak up the rest. Next, undo the pipe that takes water to the cistern, you will probably need a wrench for this. There is likely to be water still in the pipe too, so be ready with the towel to catch this as it comes out. The toilet should be fixed to the floor with some bolts these need to come out next. Just unscrew the nuts and bolts to free the toilet and cistern, then loosen any silicone that may be sealing it to the floor. You then need to remove the toilet from the soil pipe, it should just work loose with some twisting and careful pulling. At this point cover the open soil pipe with a plastic bag or stuff an old cloth into the end to prevent nasty smells coming back up the pipe. Now your old toilet is removed, give the area it was standing in a good clean ready to reinstall your new toilet. This is also the time to install new flooring if desired, but ensure the flooring is fully dried before installing the toilet on top of it. You are now ready to install your new toilet. Check that the existing holes in the floor match up with where the new bolts are on the toilet you are going to fit, you may need to drill new holes in the floor if they don't match up. Reconnect the soil pipe after removing the bag or cloth you stuffed into it, making sure it is firmly attached. Then add the bolts and screw them down to firmly attach the toilet to the floor. Do each bolt part way before going round and screwing them down firmly, don't over tighten as you could crack the toilet pan. Some toilets have different fittings such as brackets that fix to the floor inside the toilet base. The toilet manufacturer will have given instructions on these fittings. Next, you need to install the cistern. There are several types of cistern fitting, close coupled, low level or high level. The close coupled type rests on the back of the toilet pan and is secured by a couple of bolts to hold the two parts together. You will need to line the cistern up with the hole in the toilet pan, this is where the water comes through when you flush. Once it is all lined up you can secure the pan and cistern together. Then you will need to secure the cistern to the wall. This is usually a couple of bolts or screws to keep the cistern in place. For high or low-level cisterns you will need to connect a longer water pipe from the cistern to the pan. This can be a bit more complicated and you will need to fix the cistern to the wall separately. For this type and for any cistern that is made to be fitted within the wall you may need to have some professional help and guidance. The next job is to attach the water inlet pipe into the cistern using a wrench to make sure it's good and tight. It can be a good idea at this point to put some silicone sealant on the bolts joining the pan to the cistern and around the pan base to ensure the toilet is secured to the floor. Once the silicone is dry you can open the water valve and allow the cistern to fill and then do a couple of test fills and flushes just to ensure everything is watertight. If there are no leaks then your new toilet installation is complete. Now you have completed your new toilet installation, don't forget to dispose of your old toilet and fittings responsibly. Your local council should have a refuse tip where you can take these sort of items.